The university's handling of the case exemplifies how difficult — and expensive — it can be for schools to respond to controversial speech on their campuses. Seventeen thousand dollars on t-shirts. $11,000 for flashing LED bracelets. $60,000 for big-name musicians and a string quartet. $9,500 for an “expression wall” that event attendees could draw on. Texas A&M University officials decided it was worth paying those costs and more to divert attention from a controversial speaker's visit to campus in December 2016. While lawmakers and campus administrators agree that protecting free speech on college campuses is essential, doing that can be expensive for schools. Take A&M. 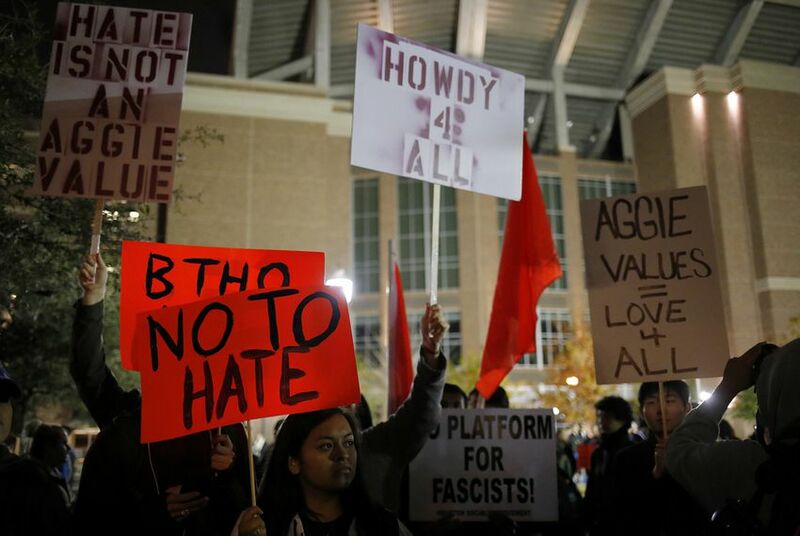 When a self-described leader of the "alt-right" movement, Richard Spencer, came to the College Station campus that year, A&M held an "Aggies United" event that filled the university's football stadium with musical acts and feel-good speeches. The cost of that three-hour rally? Around $299,000 – or nearly $100,000 an hour. “Knowing that the world would be watching this event at Texas A&M University created the challenge of allowing open dialogue under a heavy security presence but also provided an opportunity for us to demonstrate Aggie values — both to those unfamiliar with A&M as well as to Aggie families and former students — through a large-scale university-sponsored event,” said Kelly Brown, a university spokeswoman. “Executing these plans came at a cost,” she said. But all the money for the rally — which was planned in 10 days — came from discretionary funds used for holiday parties and other events. “No parent or student was financially burdened since no state dollars were used to pay” for the event, she added. Those vetoes — which happen when officials suppress speech out of concern for how others will react — have drawn particular concern from lawmakers, who often say the answer to hateful speech is more dialogue, not less. A&M officials tried to take that route in 2016. In the lead up to Spencer’s visit, A&M President Michael Young met calls to cancel the talk by citing the First Amendment and the importance of free expression. He issued a lengthy statement saying the university would, instead, host its own gathering the same evening. The counter event, the university said in a recap on its website, served as an outlet for students and a positive antidote to the negative media attention. But those three hours cost the university nearly $300,000 – roughly $50 for each of the 6,000 people that attended. The school spent $66,000 to rent and staff the school’s football field, and $4,000 for different insurance policies. The figures were found in nearly 100 pages of receipts and invoices provided to The Texas Tribune through an open records request. Among the charges were $50,000 the university paid to book the musician Ben Rector, $1,700 for a huge banner, $750 to ship that banner, $5,000 for food like “an elaborate display of seasonal local and tropical fresh fruits” ($995), and 100 deluxe sandwich boxes ($878.50). 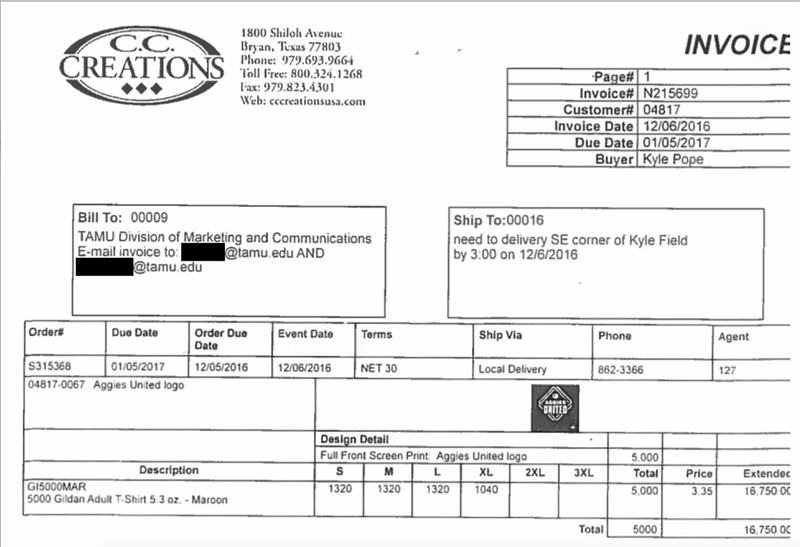 The expenses spent on A&M’s own event dwarfed the price tag attached to Spencer’s speech – the one school officials were trying to draw attention away from in the first place. Records show a private citizen paid the university about $3,500 to rent a room on-campus for Spencer to speak in and to pay for four security guards. Twenty-thousand dollars were also spent on law enforcement – from four different police and sheriff’s departments – to handle the Spencer event, the Aggies United rally, protests and traffic control. "Evidence of our commitment to free speech"
A&M officials let the event go forward despite facing significant pressure to cancel it – and “we did so at great expense given the strong security presence that was required to manage the crowd,” the general counsel, Ray Bonilla, said. And Spencer wasn’t able to make another appearance at A&M – despite being slated to attend a September 2017 “White Lives Matter” rally at a permissible area, an outdoor plaza on campus. Lawmakers called on A&M leaders to bar the event from happening and school officials canceled the rally soon after, citing safety concerns after a protest in Charlottesville – one referenced by event organizers – turned violent. The organizer of the rally threatened to sue the school after the second event was canceled, but has not.